The White House is distancing itself from slanderous comments by an unnamed Obama administration official on Wednesday, after the official was quoted by Jeffrey Goldberg of The Atlantic as having called Prime Minister Binyamin Netanyahu "chickens**t", as well as “recalcitrant, myopic, reactionary, obtuse, blustering, pompous, and ‘Aspergery." "Certainly that's not the Administration's view, and we think such comments are inappropriate and counter-productive," said Alistair Baskey, a spokesman for the National Security Council, stated Wednesday. "Prime Minister Netanyahu and the President have forged an effective partnership, and consult closely and frequently, including earlier this month when the President hosted the Prime Minister in the Oval Office." Baskey further explained away the comments - which follow strong criticism from the US State Department against Israel building Jewish homes in Jerusalem - by saying that 'disagreements' between the two governments have been blown out of proportion. 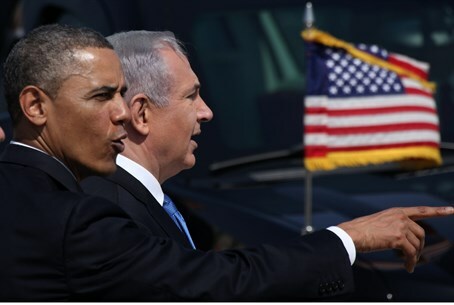 "Obviously, despite the extremely close relationship between the U.S. and Israel, we do not agree on every issue. For instance, we have repeatedly made clear the United States' longstanding view that settlement activity is illegitimate and complicates efforts to achieve a two-state solution," he said. "The U.S.-Israel relationship remains as strong as ever, our security bonds have never been greater, and the ties between our nations are unshakable. We remain fully and firmly committed to Israel's security. And, Prime Minister Netanyahu has repeatedly affirmed that he shares the U.S. view that the best solution to the Israeli-Palestinian conflict is to establish two states living side by side in peace and security." State Department spokeswoman Jen Psaki agreed there were issues "where we express concern and there's disagreement," but amid concerns that US-Israeli ties are plunging to new lows, she insisted the US relationship with Israel "remains strong." "Our security bonds have never been greater and the ties between our nations are unshakeable," Psaki told AFP reporters. The remarks caused an instant firestorm from Israeli public officials, with several MKs lashing out at the Obama administration over its "chutzpah" and one former ambassador stating that US-Israel relations were in the midst of a serious crisis. Netanyahu himself responded directly to the personal attack earlier Wednesday, during a special Knesset session marking 13 years since the assassination of Tourism Minister Rehava'am Ze'evi (also known by his nickname "Ghandi") by Palestinian terrorists. "When there is pressure on Israel to give up on its security the easiest thing is to give up," he said. "As prime minister I stand for the security of Israel. The life of every single citizen and soldier matters to me, and I am not prepared to make compromises that will endanger our country." "Our interests are not on the minds of those who attack us or me personally," he emphasized. "The attack on me comes because I defend the State of Israel, and despite all the attacks I will continue to defend our country and the citizens of Israel."